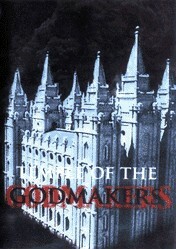 The Temple of the God Makers is basically a scaled down version (26 minutes) of The God Makers, but with greater emphasis on the rituals done within the LDS temple. These bizarre rituals are done by the LDS patrons for themselves as well as for the dead (many of these rituals are obsolete since the LDS Church has changed them in 1990 and again in 2005 [for more detail on the LDS temple ceremony and its continued evolution, see here and here]). Not only are they bizarre, but the film demonstrates just how occultic they really are. The Temple of the God Makers also contains the short animated clip that was used in The God Makers. This clip serves as the backdrop for why all these rituals are necessary, namely, to become exalted gods who can populate their own planet and receive exclusive worship from their own progeny. The film poignantly ends with the late Thelma "Granny" Geer explaining how we don't need all this stuff. We don't need secret, errr "sacred" handshakes and passwords in order to enter the celestial kingdom. This all detracts from the "simplicity that is in Christ" (2 Corinthians 11:3-4). Those who simply are in Christ through genuine faith are also in the Father (John 10:27-30; 14:1-3). So those who are in Christ "are complete in him" (Colossians 2:10). For more on The Temple of the God Makers, see here, here, and here.